The Brehm Tower is a new clinical and research facility located to the west of the existing Kellogg Eye Center Building. 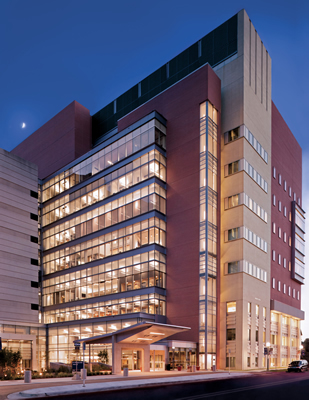 With eight floors, the Tower provides 230,000 gross square feet — housing expansion space for the Department of Ophthalmology and Visual Sciences, and space for the Brehm Center for Type 1 Diabetes Research & Analysis and other Brehm Center activities. 72,000 net square feet will support Ophthalmology and Visual Sciences programs, including clinics, surgery suites, research space, faculty offices and support spaces. 33,000 net square feet will house the Brehm Center activities including research labs, systems analysis and bioinformatics offices, a “Cure Room” convening space, and related support. 11,000 net square feet will house general Health System research and related support spaces. A common lobby, atrium and general building services will support the three functional occupants of the building.